Skirt steak grills up with a little oomph when there's jalapeños and fresh cilantro in the marinade. And mellow radishes are the perfect complement. Blend mayo, peppers and cilantro in blender until smooth. Pour 1/4 cup mayo mixture over steak in large shallow dish; turn steak over to coat both sides. Refrigerate 30 min. to marinate. Heat grill to medium heat. Remove steak from marinade; discard marinade. Grill steak 3 min. on each side or until medium doneness (160°F). Meanwhile, squeeze juice from 1 lime half into small bowl. Add radishes and dressing; mix well. 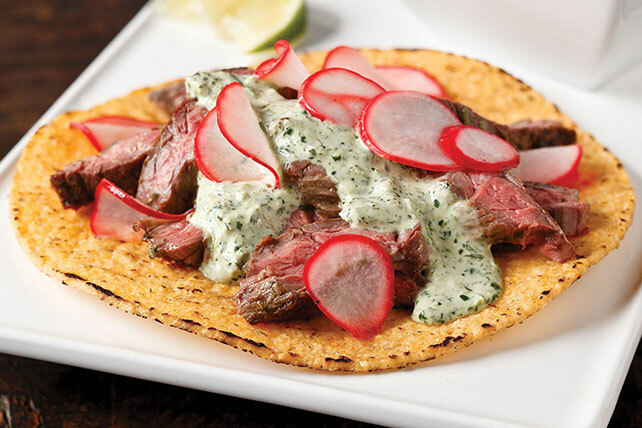 Cut steak across the grain into thin slices; place on tostada shells. Top with remaining mayo and radish mixtures. Squeeze juice of remaining lime over tostadas. Combine radishes, juice of the lime, dressing and sliced steak in medium bowl. Serve with tortilla chips; top with mayo sauce. Great for a summer outing!